Can you imagine being a member of something which allows you to access all the offers which exist in a city for nothing in return? Well, this is now a reality, especially if Madrid is your next destination, because just by joining the website www.vuelveamadrid.com you will have access to an endless number of offers for restaurants, shows, attractions and museums. If you travel often to Madrid for business or pleasure, you will definitely want to check out this programme of tempting offers. Just by registering, you get a total of 600 points which you can exchange during your next trip to the Spanish capital, because that is what it is all about: building customer (or visitor, in this case) loyalty amongst tourists in Madrid, whether it is a casual trip or one which was planned a long time ago. It is an official initiative by the City Council which is free and whose only requirements are being over 18 and not living regularly in the city. Once you return, you can exchange your points on the website for vouchers which you can show on your mobile phone. It is that easy. You can use these discounts in over 200 restaurants, among other advantages. 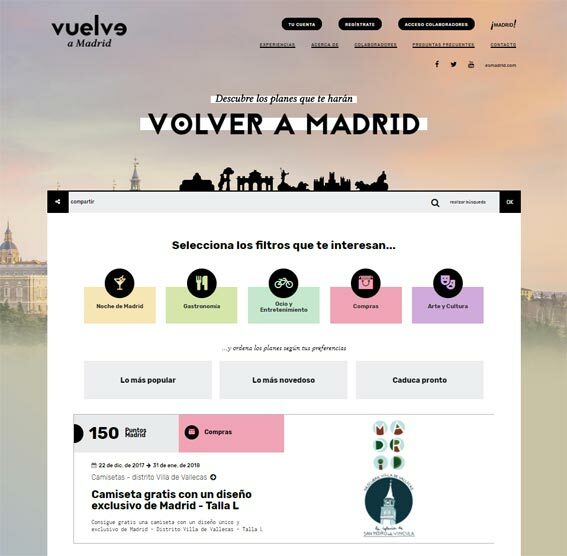 Another interesting aspect of Vuelve a Madrid is that its website shows the city’s main tourist attractions, working as an essential guide of the city. Museums, landmarks and nightlife spots are just some of the recommendations, showing the versatility of this initiative. If you are one of those travellers who does not like to plan anything for the trip or regularly travel to Madrid unexpectedly for work, you can easily access the website’s contents from your mobile phone and check it whenever you need. Lastly, don’t forget that loyalty also has its rewards at Hotel Liabeny. If you register at Club Hotel Liabeny on our official website, you will get a 10% direct discount on all the bookings you make on it.